Noodles and Pasta | Is it vegan? So which noodles are vegan in Japan? As a general rule, udon noodles and soba noodles are vegan, while ramen noodles are not. 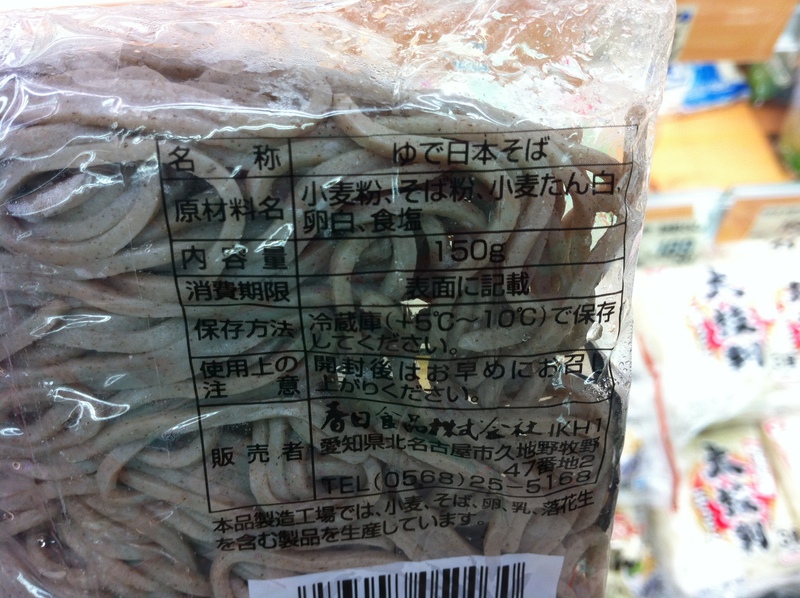 (The soup or sauce that comes with udon, soba and ramen in non-vegan restaurants contains animal products like fish stock, etc.). 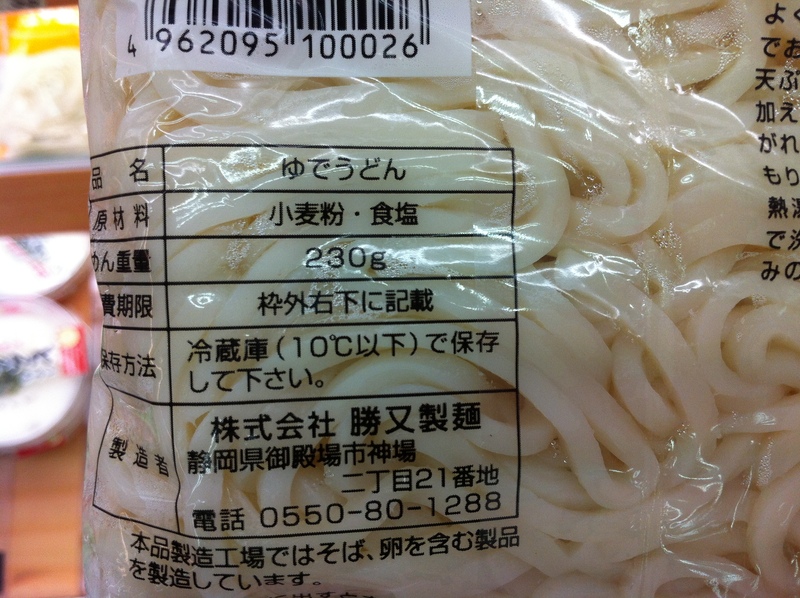 However, udon and soba noodles are not always vegan, so vegans still need to be careful to check for animal ingredients. Below are some examples of vegan and non-vegan noodles in Japan. How about pasta? That’s not such a problem. Further below are some examples of vegan and non-vegan pasta. • Yude (boiling) Japanese Soba. 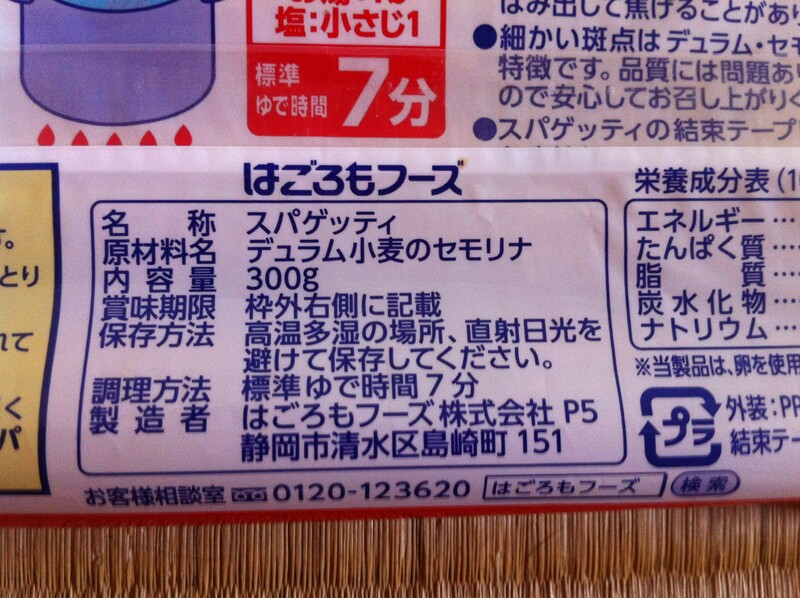 Ingredients: Wheat flour, buckwheat flour, wheat protein, egg white, salt. The soba below appears to be vegan. 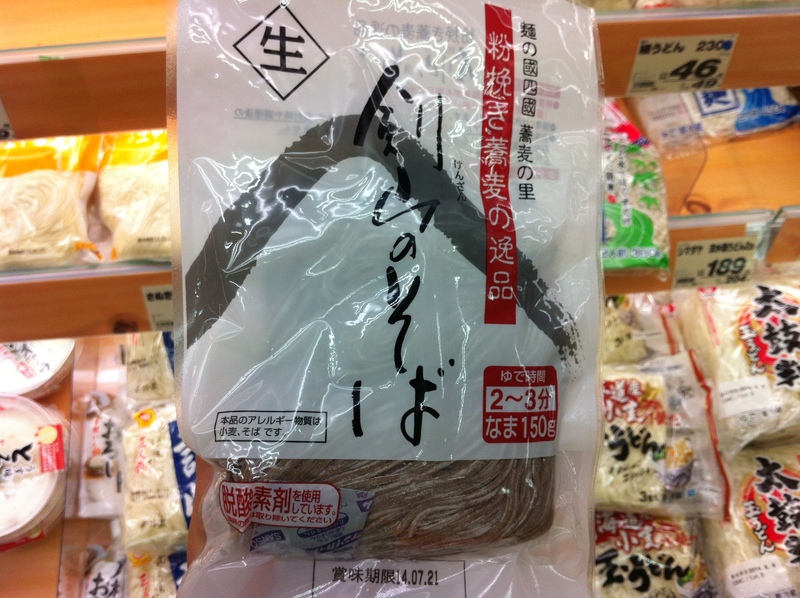 • Nama (raw) Soba. Ingredients: Wheat flour, buckwheat flour, salt, reduced starch syrup, alcohol, acidity regulator, modified starch. • Yude (boiling) Udon. Ingredients: Wheat flour, salt. Note: manufactured in a facility that also makes products containing egg. 99.9% of ramen noodles are not vegan as they contain egg (vegan ramen is available at some restaurants like T’s Tan Tan in Tokyo Station and Chabuton – see Fast Food, and T’s Tan Tan also has vegan cup noodles to take home). • Nama (raw) Ramen. Contains whole egg powder. Fired calcium, 焼成カルシウム, can also be derived from shells or eggshells. Here is another example of an ingredient list of ramen noodles that are not vegan because they contain calcium derived from shells (貝殻カルシウム), spotted at the Ramen Museum in Yokohama. It’s easy to find vegan pasta in supermarkets. Recently many supermarkets have begun carrying a small selection of whole-grain pastas as well. Vegans have to be careful with colored pasta. 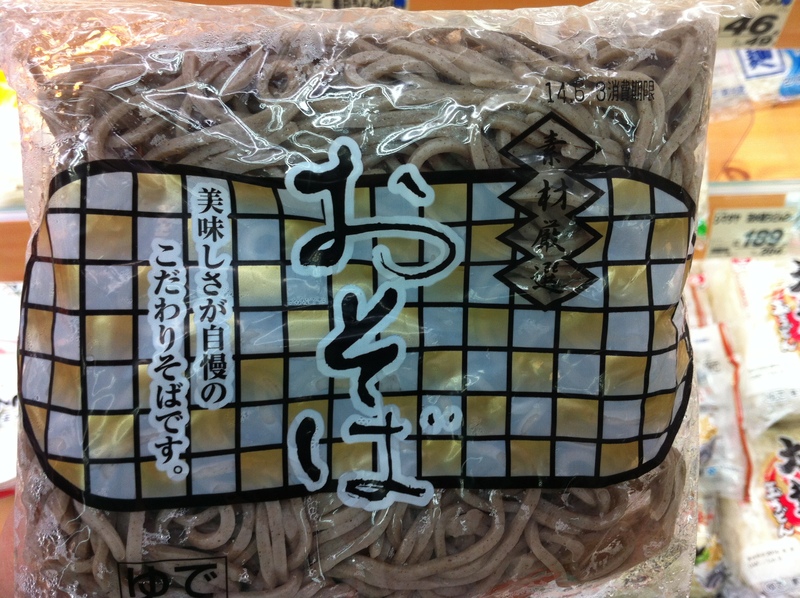 Black pasta can sometimes be colored with cuttlefish ink/イカスミ. 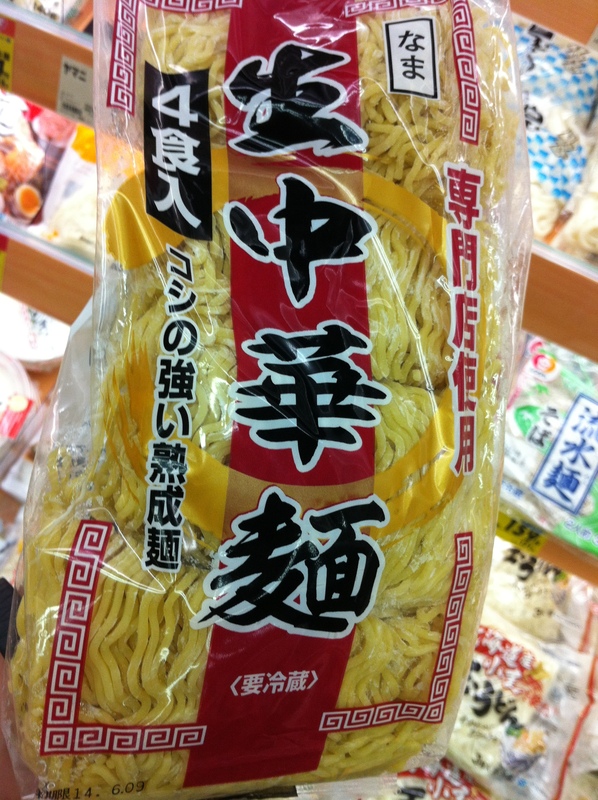 Below are some examples of pasta available in Japan. 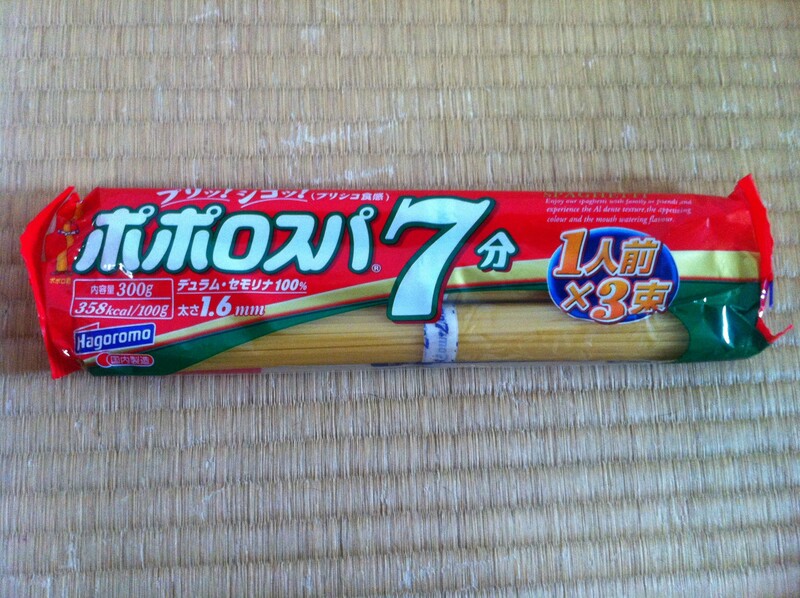 • Hagoromo 7 Minute Spaghetti/はごろもフーズ　ポポロスパ7分結束. Ingredients: Durum wheat semolina. 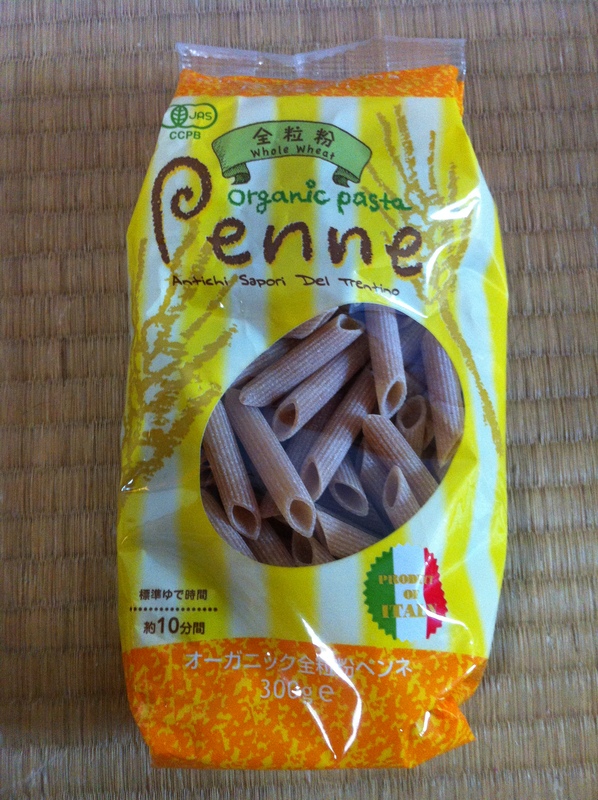 • Mitoku Whole Wheat Organic Penne Pasta/ミトク フェリチェッティ オーガニック全粒粉ペンネ. Ingredients: Organic durum wheat whole grain flour. • Della Costa Disney Princess Tricolored Pasta/ダラコスタ ディズニープリンセス . Ingredients: Durum wheat semolina, spinach, tomato. Photo from website. • De Cecco Fettucini no 303 All’uovo is not vegan because it has eggs. Ingredients: Durum wheat seminola, eggs. The word “all’uovo” indicates that the product contains eggs/卵/tamago. However, not all kinds of fettucini have eggs. 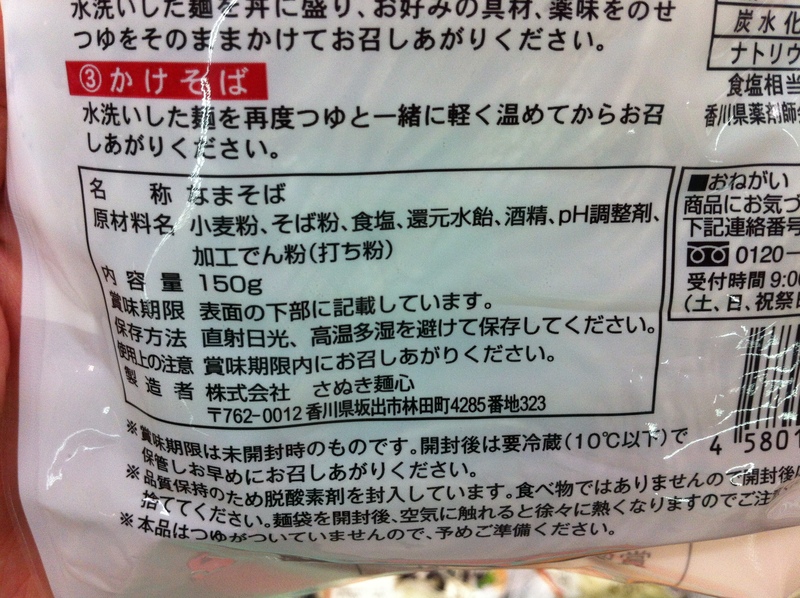 The below product from Mujirushi Ryouhin does not. Below are some photos from a pasta display in a grocery store. Other than the fettucini first on the left on the top shelf in the first photo, which has egg, all the other products appear to be vegan. The gnocchi second from the left on the top shelf in the first photo has emulsifier and flavorings of unknown origin. (The two products at the right on the top shelf in the first photo are rosti potatoes, not pasta, and one has cheese). Smaller health food and specialty stores will sometimes carry non-seminola pastas. The photo below was taken at a small shop in Kurashiki, Okayama and shows green peas fusilli, red lentils fusilli and chickpeas fusilli. The vegan restaurant chain T’s makes instant vegan cup noodles in two flavors. They appear to be the only vegan cup noodles available to purchase in stores in Japan, although more can be ordered from import websites like iHerb. • T’s Noodle Vegan Tantan Noodle Soup Ingredients: noodles (flour, salt, soybean dietary fiber), soup (sesame, salt, sugar, vegetable fat, miso, onion powder, yeast extract, chili bean sauce, spice, protein hydrolyzate, flavor oil, shiitake extract), condiments (sesame, granulated soybean protein, corn, bok choy, red pepper), thickener (processed starch, guar gum), lye water, caramel pigment, antioxidant (vitamin E), acidulant, capsicum pigment, spice extract. Both flavors use non-fried noodles and use as few additives as possible. Vegan instant noodles that require cooking on a stove are rare in Japan. 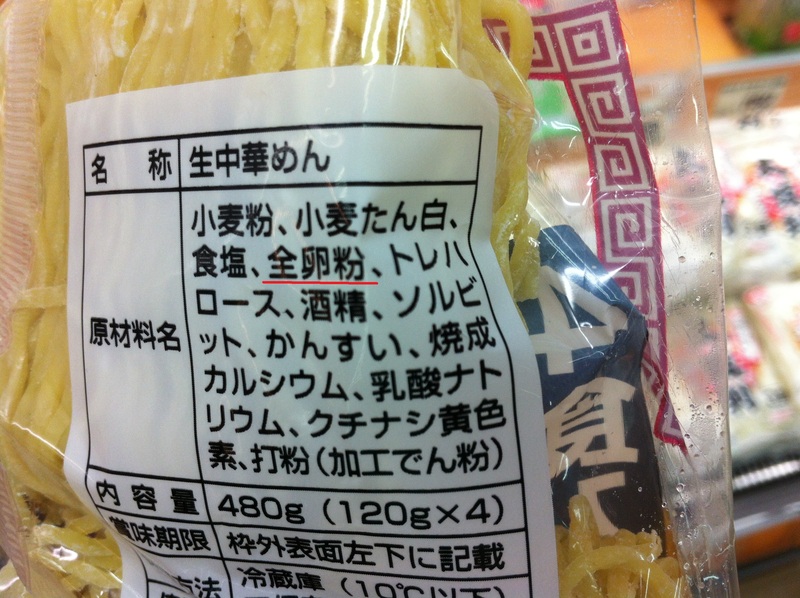 The instant noodles in supermarkets all appear to contain animal products. One brand you might be able to find is Samurai Ramen, which can be found at vegan food festivals or in some Don Quixote stores or ordered online. It comes in both a less expensive plastic pack and a gold gift pack. The plastic pack version is also available at selected Gyomu Supermarkets for 198 yen. Chemical condiments & additives & preservative-free. Photo on the left from website. If you have a health food store near you, you’ll probably be able to find more kinds of vegan instant ramen there, or order online. Some examples of vegan instant ramen available at health food stores are shown below. 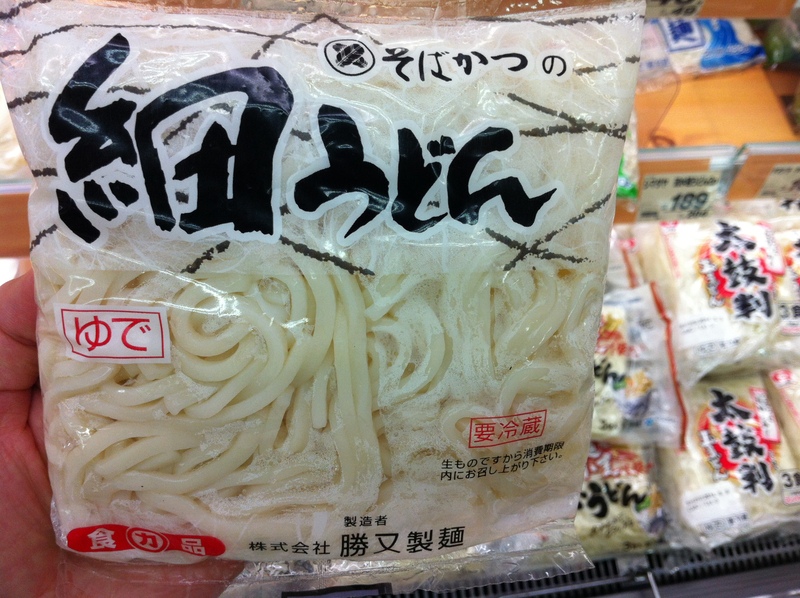 Products containing shrimp, crab, soba, egg, milk, and peanuts are processed in the same factory. 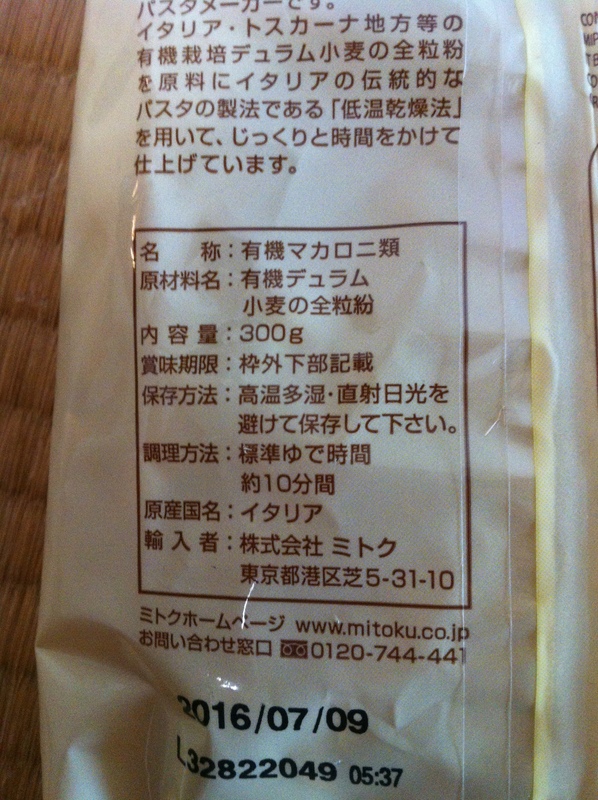 Marked “does not use animal ingredients or chemical seasoning” in Japanese on the package and “for vegan” in English. Uses domestic wheat and brown rice flour, no lye water, and non-fried noodles. Uses “shimamars” salt, which is made by dissolving imported solar salt in Okinawa sea water and slowly boiling it in a flat pot over time. To guarantee the safety of our goods, we are committed to manufacturing and selling a variety of food products with ingredients from domestically contracted farmers who use organic or ecologically friendly methods to produce their agricultural products. Marked “vegan” in English on the package. Sakurai Foods Ramen for Vegetarians/ベジタリアンのためのラーメン is an inexpensive and tasty product sold at many health food shops, but these photos were taken at the Ramen Museum in Yokohama, a fun place that also has many ramen restaurants, some of which can make vegan ramen. Ramen for Vegetarians comes in soy sauce and miso flavors. No animal ingredients are included. This version of the classic and usually non-vegan dish yakisoba is vegan/oriental vegetarian with no msg. Marked vegan in English on the package.